Today I wanted to share a few products that I have had for awhile and have been meaning to review and swatch. If you’re new here, there’s something you should know: I love Hard Candy makeup. I think they’re an underrated drugstore brand and I wish I saw more people talking about their products! There are some misses, but lately they have been coming out with some stellar and affordable products, and I want to share a few with you all today. The two products I want to share are an ombre baked blush and a highlighter duo. 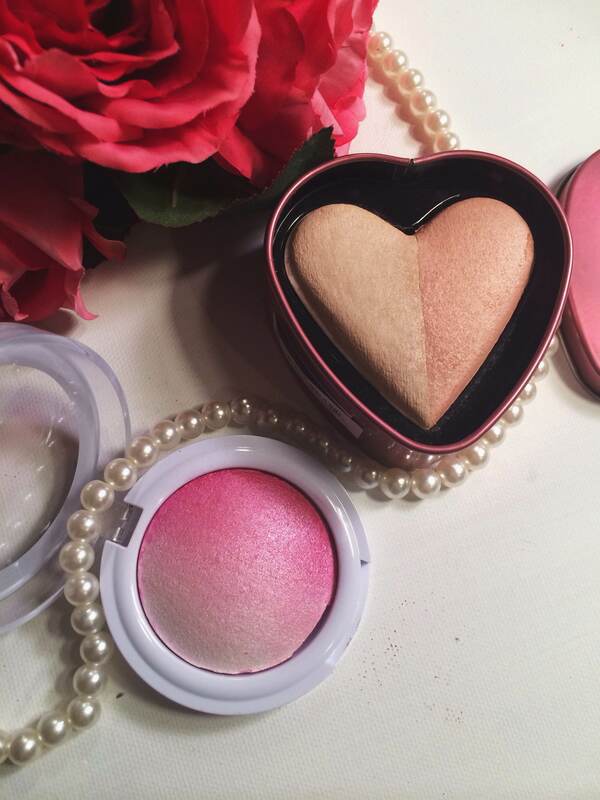 The baked blush I believe is permanent, but the heart shaped highlighter is not, sadly. If you’re unfamiliar with Hard Candy, they’re a Walmart exclusive brand that is also cruelty free. I have done a review of their new Natural Eyes palette that I will link at the end of this post. 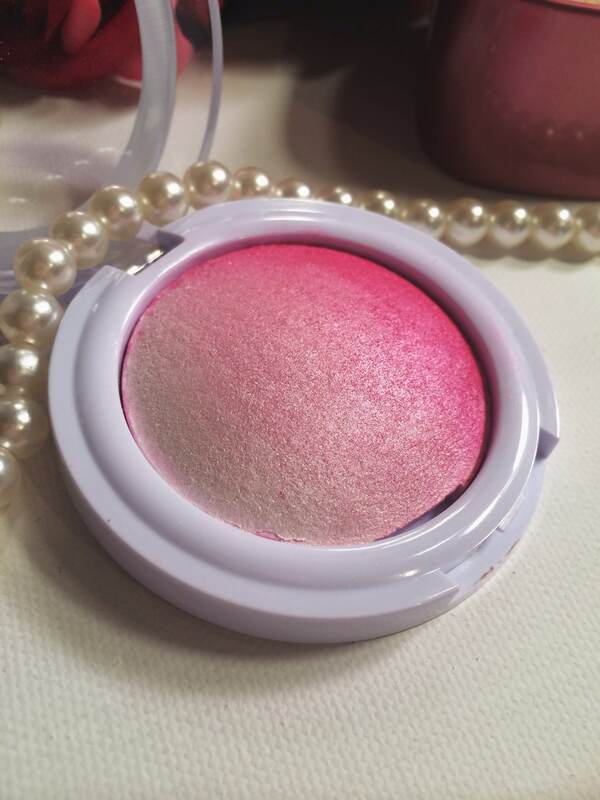 First up, this baked blush. Can we just admire it for a second? It’s so gorgeous. I love baked blushes in general because I find them to be pigmented and shimmery, so many times they act as a highlighter-blush in one. No need for extra steps in my routine on a busy morning? Score! What’s unique about this ombre blush though is that you can kind of “customize” the shade you want based on where you apply your brush. You can go to the white side for just a highlight. You could go on the other side for an intense pink, or somewhere in the middle for a very pretty pink glow. It’s up to you! 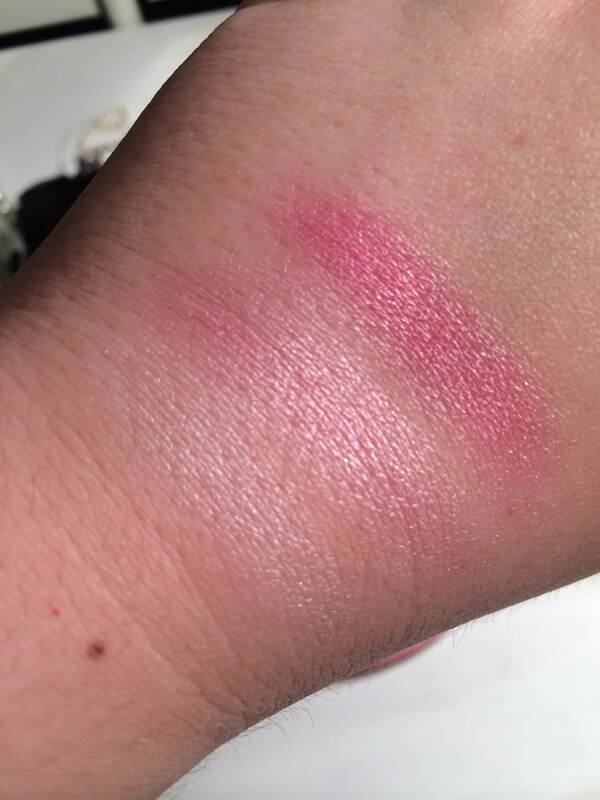 This product is very pigmented and swatches very well. It looks beautiful on the cheeks. I have the shade “punch” but I’m really tempted to go and pick up the other shade as well. I find that it doesn’t take much at all to get color to your cheeks, so be wary of that if you’re not into the intense Snow White kind of look (I am, not gonna lie). See, it’s totally like getting 3 colors in one product! I love this little baked blush. 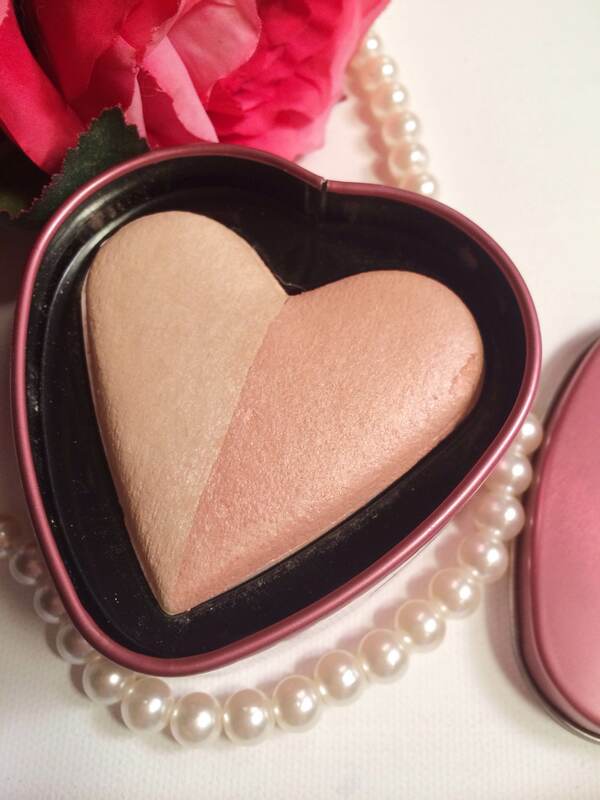 Highlighter duo: First off, the cute little heart tin packaging spoke to me. So reminiscent of the Too Faced heart-shaped boxed blushes. It’s not as fancy as the Too Faced ones, but it’s still cute in terms of drugstore packaging. This was part of the collection Hard Candy released for their 20th anniversary. There are two sides, obviously. A lighter and darker side. I didn’t know how the darker side would look on my fair skin, but surprisingly this product leans more on the “natural glow” side than the “wam bam highlighter in yo face” side. There’s no visible glitter in it. The texture and finish reminds me much of Physician’s Formula highlighters, and those are my absolute favorite highlighters in the drugstore. This duo felt very soft and buttery to the touch. You can tell when you touch it that it is finely milled. I’ve also seen people depot the heart very easily by just popping the little booger out and into a z-palette, if that’s something you would want to do. Because this is a duo, you can use either side or mix both shades together. The swatches I have are of just each side. 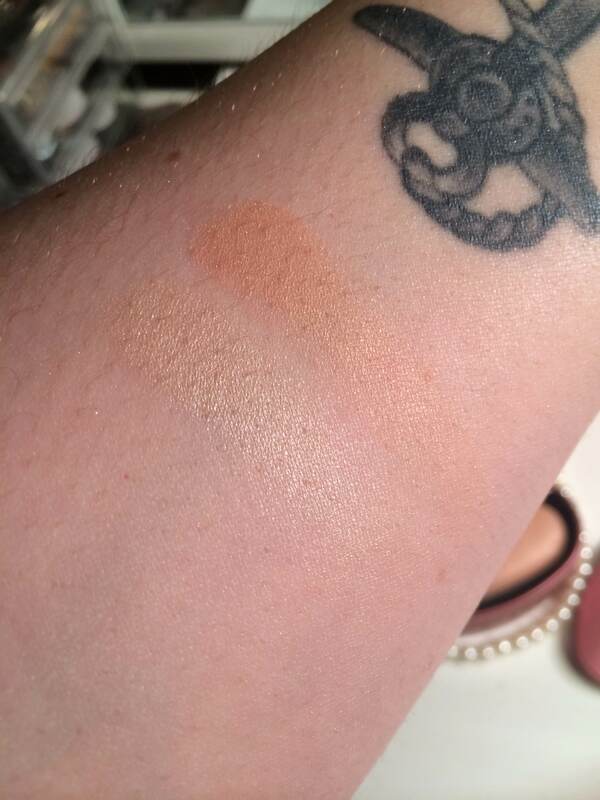 I had to go over each swatch a few times simply because this product really does give a natural glow and it’s pretty hard to overdo it. It lasted fairly well on my face, but I will say that after about 8 hours it seemed to fade away. I don’t touch up many times throughout the day, so that’s something to keep in mind if you’re wanting to wear this all day…it might fade after awhile. Would this be work appropriate? Yes. Appropriate for a night out at the club? Maybe not. I will say that overall I’m happy with this little tin of prettiness, and I think this will look pretty in the Fall when I want a more toned done “glow from within” type of look. It’s a very pretty champagne highlighter that is pretty good quality in terms of drugstore highlights. Do I like this more than my holy grail Physicians Formula?? No, but I do think this is a nice and cute thing to add to your collection if you’re a Hard Candy lover. As always, thanks for reading this post if you made it this far, and if you’re new here I hope you stay awhile!